Now that the magazine pile is gone, it is time to dive head first into fulfilling my next personal resolution which was to read 12 books which represent a book a month. The first selected was a Christmas present from Carole's boyfriend, Larry. I had never heard of this. Perhaps, like me, your first inclination is to shudder. The second inclination is to laugh out loud. Okay, I'll bite. 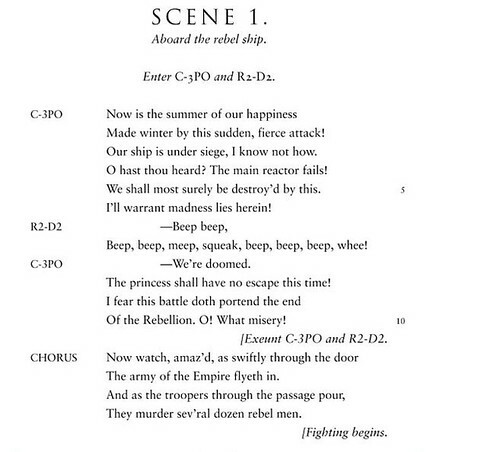 It's the movie Star Wars (Part 4 to be precise but that movie was the first one and it will always be the one I think of when someone says "Star Wars") written as Shakespeare would have done it. I hope they didn't spend too much on this because it's bound to be cringe-worthy. The publishers know there are a lot of Star Wars fans so they can toss anything out into the ether with a Star Wars theme and know it will be a hit. To say I was skeptical was a bit of an understatement. I sat down a Saturday afternoon in February as the snow was falling and cracked open the book. "Now is the summer of our happiness"? That's a permutation of "Now is the winter of our discontent" from Richard III. And "The princess shall have no escape this time!" is a direct quote from the movie. Hmmmm. This could be interesting. It took me 2 weeks to read the book, owing to having other things that came up which required my attention. But, what you see in the first scene is what the book is. Intersperced with direct quotes from the movie are some of Shakespeare's most well-known lines. "But soft, what light through yonder window breaks." Wait a minute. That's not referring to droids. King Lear, Macbeth, Julius Caesar were quoted. I found myself laughing out loud, which may or may not, have been intentional. The author wrote quite a bit of iambic pentameter to fill out the lines he quoted directly from the script or from Shakespeare. I also found myself going, "Hmmmm...I know that but what's the original line" when it came to some lines he used from Shakespeare but had to rework to make them fit the Star Wars theme. He follows the form of Shakespeare's plays. There are 5 acts and, generally, 5-7 scenes within each act. The end of the book felt rushed to me, as if he'd run out of play notations to use and he just wanted to get it finished. In spite of this, he maintains the iambic pentameter of Shakespeare and I tested random lines for this familiar beat. The weakest lines are lifted directly from the movie, as one would expect, but he was careful to select lines that follow this necessary format. I was prepared to dislike this book and found myself enjoying it. I was prepared to find some hack had taken the script and forced Shakespeare into it as there are reams of masters and doctoral theses given over to Shakespearean themes in Star Wars. I remember reading, back when I was writing my senior thesis, that there are no new plots anymore. The Greeks "invented" them all and anything now is a retelling of those. I suspect the Greeks took their plots from older, oral, stories. 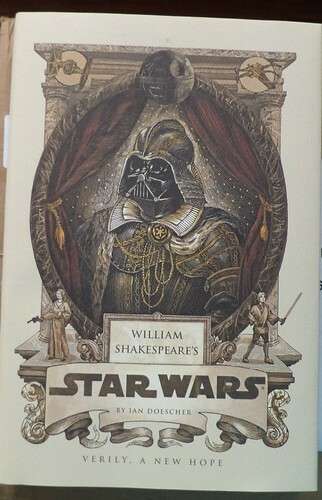 Shakespeare just borrowed some of their ideas and changed the framework, just as George Lucas did, millenniums later. The author had Lucas' help in assembling this which give the book an air of authority. He wasn't some hack who thought he could make a quick buck in the Star Wars market. This was a labor of love and of craft. There is not a broad range of appeal for this, however. I can see many fans would be put off by having to read the script as Shakespeare might have written it. I very much enjoyed it and it's the kind of book that I will come back to when I want a light read. I think I will appreciate it a bit more the second reading through. only bits and pieces in the bookstore.